Guess what? We have winners in the house!! Thank you all for making the first Chasing Community linkup so much fun. I’m honored to share this space with your gifted, inspired words. I look forward to meeting you here every Thursday—at this table set with prayed-over words poured out in service to the One who first gave them. Okay, so I went all high-tech on us and drew names from a bowl. I know, call me fancy. How I wish I had a gift for every one of you! But, good news! No worries if your name wasn’t drawn this week, because every month will have its own drawing for a special gift! Everyone who links up that month will be entered to win! Yippee Skippee! Congratulations, ladies!! Be on the lookout for an email with gift-card info! And y’all—I’m already excited for our February Drawing! Yay! Best of luck to everyone next month! Do you have a 2017 Word ? If so, I’d love to hear. Me?–January 12th and I’m still trying to understand my word’s potential impact on the year ahead. The scary + good news is that—I don’t know. And that’s okay, because the less I know, the less I’ll try to control it! What about you? Is there a word you’re feeling called to this year? Thanks for using the #ChasingCommunity button (code above), or linking back here underneath your post–so others will know how to join the fun! I’m linking up today with my friends at #ChasingCommunity. « Linkup Launch & Giveaways!! Oh, I love your “high tech” way of drawing names….a woman after my own heart lol. My word for 2017 is “Fire” as in I want to be on fire for the Lord. And, in order to do so, I need to continually be in His word – the source of any flame I might have. I’d have used that same high tech method, Brenda! Congratulations to your winners. I like the word stand. Mine is “Jesus.” Blessings to you this year, friend, as you stand firm in Him! And thanks again for your help the other day. I so appreciated it. I love your low-tech way of drawing names and I still prefer it over all the tech versions out there! 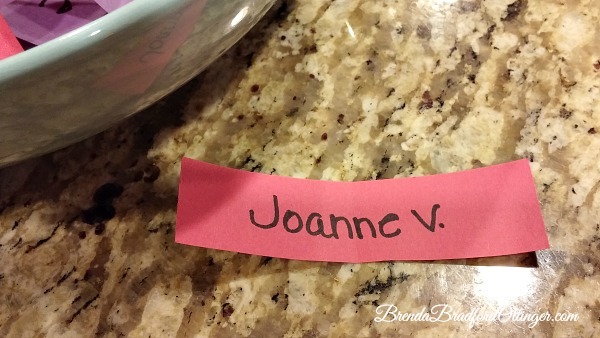 I am a hand written names on a tiny piece of paper drawn from a bowl kinda girl, too! My word is INVEST… I’m a little scared, but trusting God to walk me through it! Blessings! High tech is certainly overrated…?, paper and pen and a bowl are completely scientific. That’s how I handle many decisions I make. Stand reminds me of Ephesians 10, and putting on the armor of God, but first we stand firm in His promise. working on me. But it is a prayer of belonging to God alone, of being known and searched by Him. It is probably the prayer I have needed to pray my whole life. I’m with you, Brenda! 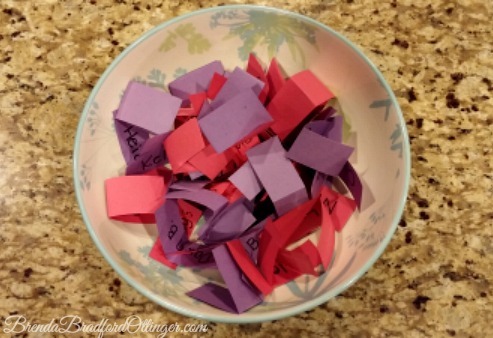 Name tags in a bowl … or maybe a hat! WOOHOO!!!! I Can’t believe I won something!!!! Unless there’s another Sherry S.? If there is, I’m cheering for her 🙂 Thanks Brenda!!!!! As for this year’s word…I feel that I know what the word is but I am spending today praying with one of my prayer partners to cover this new year. I don’t want to say until I have full confirmation from Daddy. I loved Kelly R Baker’s post this week about what to do with your Word of the Year. Thankful for how you’ve opened up this new community and overjoyed I was chosen! Praying you have a fun day with today’s linkup. 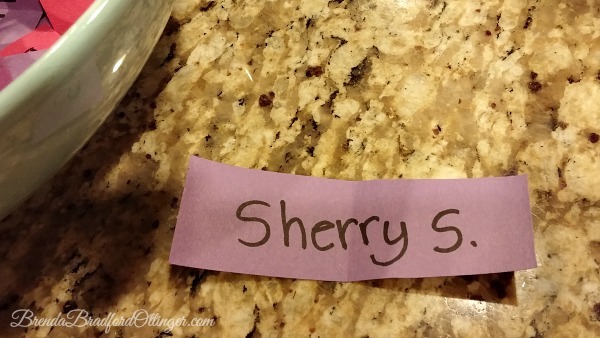 yay for you, Sherry! You sound like me, I’m always shocked when I win stuff. I don’t seem to have been born under a lucky star. 🙂 Congrats to you! Sherry, thanks for mentioning my post here! Congrats on your win! Love the high tech method as it is always fun! My word this year is “Audacious” as my desire is to live more boldly and courageously this year. May this linkup continue to grow and bless many! Oh! Audacious — wow, that sounds exciting. How do you see that playing out in your life this year? Love that, Joanne, thanks for sharing. The word I keep hearing God put on my heart is “honor.” I haven’t quite committed to it. In all honestly, I am having an internal struggle because I thought I did show honor to God and others. I am sure he has more to show, grow me, and teach me. Your word is “stand” and my word is “standing”! I guess the Lord has some twin messages He wants to communicate to us this year. My choice came to me through Romans 5:1,2 in The Message Bible: By entering through faith into what God has always wanted to do for us—set us right with him, make us fit for him—we have it all together with God because of our Master Jesus. And that’s not all: We throw open our doors to God and discover at the same moment that he has already thrown open his door to us. We find ourselves standing where we always hoped we might stand—out in the wide open spaces of God’s grace and glory, standing tall and shouting our praise. “Stand” ~ what a good word. It’ll be interesting to see how that is threaded through your life this year, Brenda. I don’t really pray about a word, but I do seek the Lord for guidance in the new year. This year I’m hearing to follow “day-by-day”, to trust wholly. I’m breathing deep because it’s already bringing life to a whole new level. Thanks for the reminder to visit here. I plan to come back! STAND. Wow. Such potential and power and simple authority. It’s a deep inhale and even deeper knowing. So exciting! 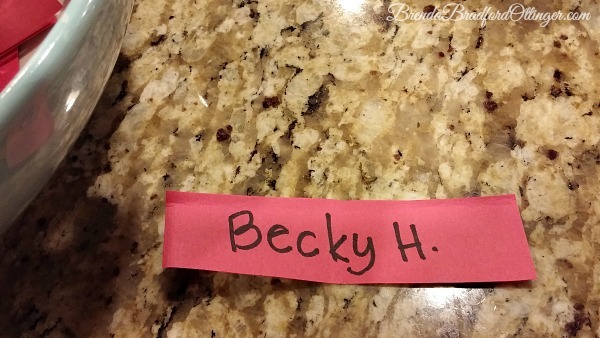 And not sure if you have a lot of Becky H’s, but if I won one of the gift cards…thank you! Brenda, your low-tech methods are endearing and are exactly how I would have done it. I’m happy for the three ladies who won. Congratulations!! I appreciate the friendship and community you are building up here, Brenda. Way to go. My word is “endure”. A simple, yet profound calling to keep going despite a multitude of obstacles. I like your word for the year. I know what you mean about feeling drawn to a word and having no idea where it will take you. I felt like that last year with the word “surrender”- it was a word that scared me but it was exciting to see how God used it. My word this year is “voice”- I’m not sure exactly how it will work out but my initial thoughts are it is to do with recognising and choosing to listen to God’s voice as well as finding my voice to speak out more in sharing what God has done. My word for this year is BLOOM?. The Lord has been hovering over the seeds He has quietly planted in my heart over the last couple of years.